Following is Part 2 of an excerpt from my new book, “Incredible Stories From Space: A Behind-the-Scenes Look at the Missions Changing Our View of the Cosmos.” The book is an inside look at several current NASA robotic missions, and this excerpt is part 2 of 3 which will be posted here on Universe Today, of Chapter 2, “Roving Mars with Curiosity.” You can read Part 1 here. The book is available in print or e-book (Kindle or Nook) Amazon and Barnes & Noble. The landing occurred at 10:30 pm in California. The MSL team had little time to celebrate, transitioning immediately to mission operations and planning the rover’s first day of activity. The team’s first planning meeting started at 1 o’clock in the morning, ending about 8 a.m. They had been up all night, putting in a nearly 40-hour day. A day on Mars day is 40 minutes longer than Earth’s day, and for the first 90 Mars days – called sols — of the mission, the entire team worked in shifts around the clock to constantly monitor the newly landed rover. To operate on the same daily schedule as the rover meant a perpetually shifting sleep/wake cycle where the MSL team would alter their schedules 40 minutes every day to stay in sync with the day and night schedules on Mars. If team members came into work at 9:00 a.m., the next day, they’d come in at 9:40 a.m., and the next day at 10:20 a.m., and so on. Those who have lived through Mars Time say their bodies continually feel jet-lagged. Some people slept at JPL so as not to disrupt their family’s schedule, some wore two watches so they would know what time it was on two planets. About 350 scientists from around the world were involved with MSL and many of them stayed at JPL for the first 90 sols of the mission, living on Mars Time. But it took less than 60 Earth days for the team to announce Curiosity’s first big discovery. A 16-ft. (5 m) high sand dune on Mars called Namib Dune is part of the dark-sand ‘Bagnold Dunes’ field along the northwestern flank of Mount Sharp. Images taken from orbit indicate that dunes in the Bagnold field move as much as about 3 feet (1 m) per Earth year. This image is part of a 360 degree panorama taken by the Curiosity rover on Dec. 18, 2015 or the 1,197th Martian day, or sol, of the rover’s work on Mars. Credit: NASA/JPL-Caltech/MSSS. Ashwin Vasavada grew up in California and has fond childhood memories of visiting state and national parks in the southwest United States with his family, playing among sand dunes and hiking in the mountains. He’s now able to do both on another planet, vicariously through Curiosity. The day I visited Vasavada at his office at JPL in early 2016, the rover was navigating through a field of giant sand dunes at the base of Mount Sharp, with some dunes towering 30 feet (9 meters) above the rover. 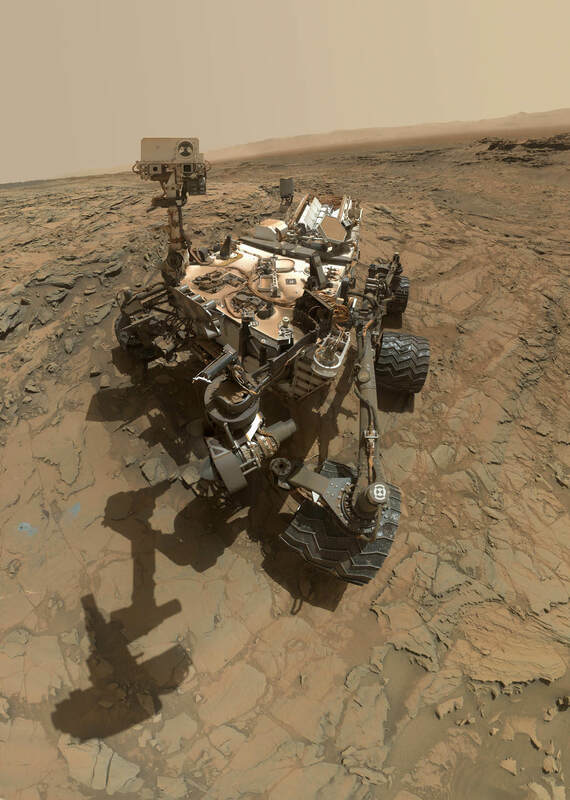 At the time we talked, Curiosity was approaching four Earth years on Mars. The rover is now studying those enticing sedimentary layers on Mt. Sharp in closer detail. But first, it needed to navigate through the “Bagnold Dunes” which form a barrier along the northwestern flank of the mountain. Here, Curiosity is doing what Vasavada calls “flyby science,” stopping briefly to sample and study the sand grains of the dunes while moving through the area as quickly as possible. Now working as the lead Project Scientist for the mission, Vasavada plays an even larger role in coordinating the mission. “It’s a constant balance of doing things quickly, carefully and efficiently, as well as using the instruments to their fullest,” he said. Since the successful August 2012 landing, Curiosity has sent back tens of thousands of images from Mars – from expansive panoramas to extreme close-ups of rocks and sand grains, all of which are helping to tell the story of Mars’ past. ‘Selfies’ taken by the Curiosity rover are actually a mosaic created from numerous images taken with the Mars Hand Lens Imager (MAHLI), located on the end of the rover’s robotic arm. However, the arm is not shown in the selfies, because with the wrist motions and turret rotations used in pointing the camera for the component images, the arm was positioned out of the shot in the frames or portions of frames used in this mosaic. However, the shadow of the arm is visible on the ground. 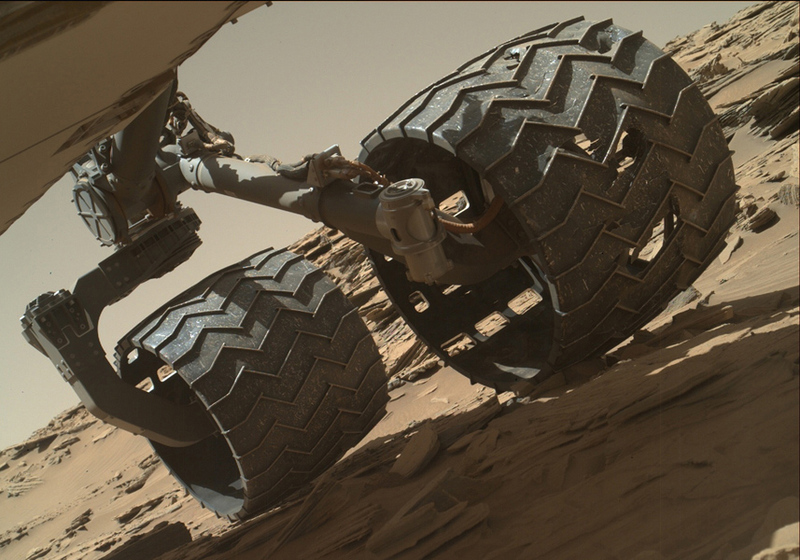 This low-angle selfie shows the vehicle at the site from which it reached down to drill into a rock target called “Buckskin” on lower Mount Sharp. Credit: NASA/JPL-Caltech/MSSS. The images the public seems to love the most are the ‘selfies,’ the photos the rover takes of itself sitting on Mars. The selfies aren’t just a single image like the ones we take with our cell phones, but a mosaic created from dozens of separate images taken with the Mars Hand Lens Imager (MAHLI) camera at the end of the rover’s robotic arm. Other fan favorites are the pictures Curiosity takes of the magnificent Martian landscape, like a tourist documenting its journey. Vasavada has a unique personal favorite. Within the first 50 sols, Curiosity took pictures of what geologists call conglomerates: a rock made of pebbles cemented together. But these were no ordinary pebbles — they were pebbles worn by flowing water. Serendipitously, the rover had found an ancient streambed where water once flowed vigorously. From the size of pebbles, the science team could interpret the water was moving about 3 feet (1 meter) per second, with a depth somewhere between a few inches to several feet. Vasavada looked down. “It still gives me the shivers, just thinking about it,” he said, with his passion for exploration and discovery visibly evident. This map shows the route driven by NASA’s Curiosity Mars rover from the location where it landed in August 2012 to its location in September 2016 at “Murray Buttes,” and the path planned for reaching destinations at “Hematite Unit” and “Clay Unit” on lower Mount Sharp. Here, Curiosity fulfilled ones of its main goals: determining whether Gale Crater ever was habitable for simple life forms. The answer was a resounding yes. The rover sampled two stone slabs with the drill, feeding half-baby-aspirin-sized portions to SAM, the onboard lab. SAM identified traces of elements like carbon, hydrogen, nitrogen, oxygen, and more —the basic building blocks of life. It also found sulfur compounds in different chemical forms, a possible energy source for microbes. Data gathered by Curiosity’s other instruments constructed a portrait detailing how this site was once a muddy lakebed with mild – not acidic – water. Add in the essential elemental ingredients for life, and long ago, Yellowknife Bay would have been the perfect spot for living organisms to hang out. While this finding doesn’t necessarily mean there is past or present life on Mars, it shows the raw ingredients existed for life to get started there at one time, in a benign environment. Still, this lakebed could have been created by a one-time event over just hundreds of years. The ‘jackpot’ would be to find evidence of long-term water and warmth. That discovery took a little longer. But personally, it means more to Vasavada. Mars’ climate was one of Vasavada’s early interests in his career and he spent years creating models, trying to understand Mars’ ancient history. That’s why the discovery made by Curiosity in late 2015 is so exciting to Vasavada and his team. The explanation that best fits the “morphology” in this region — that is, the configuration and evolution of rocks and land forms – is rivers formed deltas as they emptied into a lake. This likely occurred 3.8 to 3.3 billion years ago. And the rivers delivered sediment that slowly built up the lower layers of Mt. Sharp. For that, Mars also needed a thicker atmosphere than it has now, and a greenhouse gas composition that Vasavada said they haven’t quite figured out yet. But then, somehow dramatic climate change caused the water to disappear and winds in the crater carved the mountain to its current shape. The rover had landed in exactly the right place, because here in one area was a record of much of Mars’ environmental history, including evidence of a major shift in the planet’s climate, when the water that once covered Gale Crater with sediment dried up. • Methane on Mars: Methane is usually a sign of activity involving organic matter — even, potentially, of life. On Earth, about 90 percent of atmospheric methane is produced from the breakdown of organic matter. On Mars, methane has been detected by other missions and telescopes over the years, but it was tenuous – the readings seemed to come and go, and are hard to verify. In 2014, the Tunable Laser Spectrometer within the SAM instrument observed a ten-fold increase in methane over a two-month period. What caused the brief and sudden increase? Curiosity will continue to monitor readings of methane, and hopefully provide an answer to the decades-long debate. 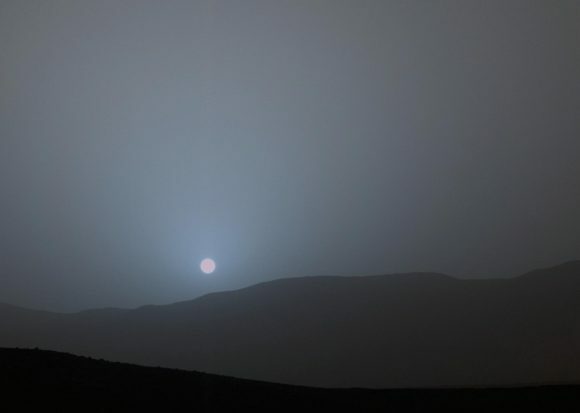 • Radiation Risks for Human Explorers: Both during her trip to Mars and on the surface, Curiosity measured the high-energy radiation from the Sun and space that poses a risk astronauts. NASA will use data from the Radiation Assessment Detector (RAD) instrument Curiosity’s data to design future missions to be safe for human explorers. Tomorrow: The conclusion of this chapter, including ‘How To Drive a Mars Rover, and ‘The Beast.’ Part 1 is available here.